This Witcher Contract is best left for later in the game. Phantom of the Trade Route is something of an aspirational Witcher Contract – you may find it soon after you first visit Velen (No Man’s Land), but you won’t be tackling it for many hours yet. Visit Benek to start this quest; it’s a village on the far east side of the Velen (No Man’s Land) map, where you visit the seer during The Truth is in the Stars. Speak to a fellow seated near a ruin to the north of the hamlet, who sends you in search of his brother. take the north path out of town until you reach an overturned cart, Use Witcher Senses to discover, among other signs, some upturned wine and a set of footprints that cut off suddenly. 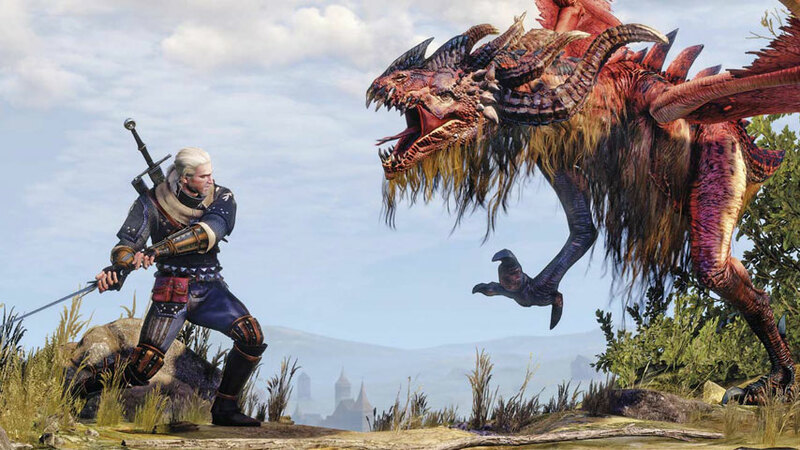 Geralt concludes a flying beast is responsible. Follow the trail of wine uphill and northeast until you reach a cave with a corpse just outside, Venture in and greet two survivors who give you a little more information. Your target is a Royal Wyvern. To reach your foe you’ll have to climb through the cave, clambering up several ledges, until you emerge on a cliffside. You’ll be attacked by two regular wyverns – but these aren’t your target. Once they’re dead, approach and destroy the two nesting sites to bring the big guy down on you. When the Royal Wyvern is dead, return to Benek to collect your reward. This battle is complicated by the cliffside – you can’t get far away if you need a breather, and taking a tumble off the edge is not recommended. If necessary retreat into the cave – but be aware that it’s easy to take fall damage doing so. It’s better to do any nexessary healing while the Royal Wyvern is in flight, if you can. As with all beasts of its kind, the Royal Wyvern is most easily brought down using the Aard sign. It’s highly vulnerable to this telekinetic attack; hit it with Aard just as it swoops on you, or just after dodging its attacks, to bring it tumbling to the ground. You can then put the boot in a bit (rolling into range if necessary), and then escaping as it clambers to its feet. If you are brave or over-levelled, you can be less cautious, circling it and attacking its flanks as you would a bear. If you try this, Yrden is a great help. The Wyvern can inflict poison, but there are two potions you can use to counter this. Golden Oriole will prevent its poison attacks from adding to your toxicity level as well as clear existing toxicity, while White Honey will simply clear accumulated toxicity. The bestiary recommends using Grapeshot against Wyverns, if you’re handy with bombs, and you should, of course, apply Draconid Oil to your silver sword. If you have acquired the recipe for Draconid Oil it’s pleasantly simple to make, requiring just two ingredients: Dog Tallow and Ergot Seeds. Dog Tallow can be harvested from wolves, and is very common. Ergot Seeds can only be purchased from Herbalists, unfortunately – it doesn’t grow anywhere – so visit your favourite supplier. Examples include the Herbalist you meet during the quests in White Orchard, the Peller, and Keira Metz.